HIMSS unveils speaker lineup featuring cybersecurity experts from Intermountain, MIT, Partners HealthCare, UPMC. It is with great pleasure that we welcome Gov. Tom Ridge as our opening keynote at the HIMSS Healthcare Security Forum. HIMSS announced today that Gov. 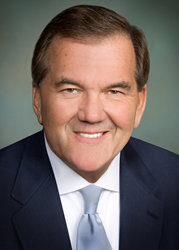 Tom Ridge, First Secretary of the U.S. Department of Homeland Security; Former Governor of Pennsylvania; and Chairman of Ridge Global, is confirmed as opening keynote at HIMSS' Healthcare Security Forum, the nation's leading conference for health organizations tackling data security. The event kicks off at the Sheraton Boston Hotel, Sept. 11-13, 2017. Ridge will deliver his keynote, "From Risk to Resilience: The Global Mission to Secure Cyberspace", Sept. 11, 2017, at 9:05 a.m. In his keynote, Ridge will explore the evolution of cybersecurity strategy, and share what to expect from emerging cyber threats, and how healthcare organizations can better integrate cybersecurity into its suite of core business functions. "It is with great pleasure that we welcome Gov. Tom Ridge as our opening keynote at the HIMSS Healthcare Security Forum," said John Whelan, Executive Vice President, HIMSS Media. "As one of the world's most renowned security experts, Ridge will bring a critical perspective around cybersecurity priorities and what healthcare organizations can do to stay ahead of the threats." Sponsored by Connection, Edge Hosting, IBM, Mimecast, Radiant Logic, Sailpoint, and Unisys, the three-day Healthcare Security Forum features 40+ deep-dive sessions, eight networking sessions, and brings together prominent security experts from leading organizations who will share critical strategies around cybersecurity; incident response; emerging threats; ransomware, risk management, identity and access management; HIPAA audits; medical device security; strategic communication; BAAs, and more. Visit our event website for more information, to register now, or see a complete speaker lineup. HIMSS Media is the fastest growing B2B media group focused exclusively on healthcare and technology markets. Through its suite of market-leading brands, such as Healthcare IT News, Healthcare Finance and MobiHealthNews, HIMSS Media delivers news, analysis and must-have information to an audience of senior healthcare and technology influencers. HIMSS Media is also the leading producer of important live events, such as Healthcare Security Forum; Healthcare Finance Strategy 2017; Patient Engagement & Experience Summit; Pop Health Forum; Revenue Cycle Solutions Summit; Big Data & Healthcare Analytics Forum; Machine Learning & AI for Healthcare; and the Digital and Personal Connected Health event. HIMSS is a global voice, advisor, convener, and thought leader of health transformation through the best use of IT with a unique breadth and depth of expertise and capabilities to improve the quality, safety, and cost-effectiveness of health and healthcare. Through its network of over 1 million professionals, including 64,000-plus members, HIMSS advises leaders, stakeholders and influencers globally on IT best practices to ensure decision-makers have the right information at the right time to make the right decisions. HIMSS North America, HIMSS Analytics, Personal Connected Health Alliance, HIMSS Media and HIMSS International (HIMSS Europe, HIMSS Asia and HIMSS Middle East) are the five business units of HIMSS. A not-for-profit headquartered in Chicago, Illinois, HIMSS has additional offices in North America, Europe, United Kingdom, and Asia.